Alyssa Lesko, fourth-year Biology graduate student, was recently selected to present her work at the 2017 Future Fellow Research Conference (FFRC) at St. Jude Children’s Research Hospital in Memphis, Tennessee. The symposium and application process are not advertised; thus, students may apply only if they have received an invitation from St. Jude, or are nominated by a faculty advisor. This competitive symposium allows PhD-level graduate students from U.S. institutions to present their work, meet faculty and learn about the cutting-edge research and facilities at St. Jude. 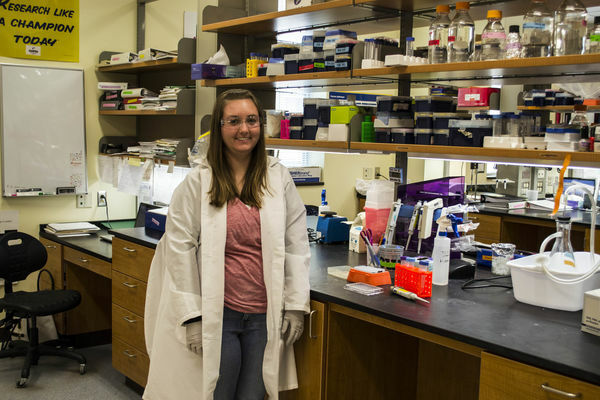 Lesko is researching in the laboratory of Professor Jeni Prosperi, Assistant Professor of Biochemistry and Molecular Biology at Indiana University School of Medicine-South Bend and Adjunct Assistant Professor of Biological Sciences at Notre Dame. She will present her work on how the loss of tumor suppressor Adenomatous Polyposis Coli (APC) and subsequently how its normal functions leads to tumorigenesis. Her project aims to determine the precise molecular mechanisms by which APC regulates apical-basal polarity in order to identify novel therapeutic targets. Specifically, the project she will present investigates how APC mediates Epithelial Membrane Protein 2 (a protein upregulated in several cancers), and its influence on cell polarity. Originally published by Jenna Bilinski at harpercancer.nd.edu on May 15, 2017.